Bullish percent (BP) charts are calculated differently than other price charts you may be familiar with. For starters, they aren’t really price charts. Second, they’re only applied to an index or group of stocks not individual stocks. And at their heart, they rely on point and figure charting. Tom Dorsey couldn’t have predicted their success or wide application when he first popularized the New York Stock Exchange bullish percent index. A bullish percent charge is calculated by first taking each component stock and charting it using the point and figure system. Then those that have a point and figure buy signal are added together and this number is divided by the total number of stocks in the index or group. Theoretically, a BP chart can span from 0% to 100% where no stock in the index has a PnF buy signal and where they all do. But usually it tends to oscillate between 70% and 30%. 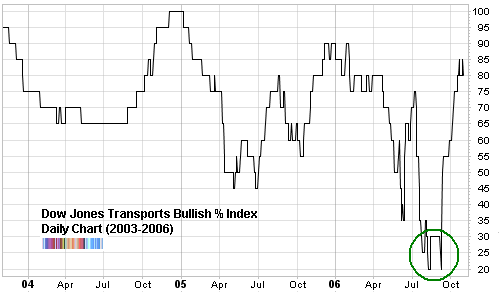 Mid-August saw the lowest reading in the bullish percent index of the transports since March 2003! Doom and gloom was thick, peak oil was being bandied about matter-of-factly everywhere and oil was pushing $80 a barrel. You would be a fool to suggest going long. But that’s exactly what the bullish percent was saying. 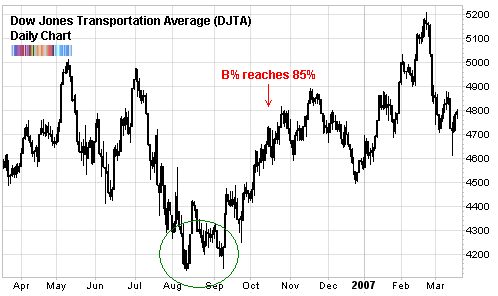 The extreme low (20%) marks the exact intermediate bottom of the Transportation Index. There is a weak retest in early September 2006 but the previous low holds. From there, the index powers ahead with higher highs and higher lows. If we assume that you were taking your exit signal from the bullish percent index, you would probably exit when it reached the other extreme (high of 85%). That would give you a 12% move in about 3 months. And that’s assuming you went with the index and not individual stocks which would have moved with a larger beta. So what about right now? Are there any sectors or indices that look like the transports did last summer? I’ve scanned them but alas, none are low enough to show an extreme washout. But keep an eye out on the bullish percent and you may find a very compelling signal soon. Nice BP chart. But can you share with us, where did you generate the BP sector chart? the chart is like that because the denominator is small which makes a change in any one constituent have a large effect. you can make your own custom index thru stockcharts.com fee service (not the free one) or you can subscribe to Tom Dorsey’s site and get a whole bunch of sectors, including gold stocks. I am using both BP% and % of stocks above their 50 DMA for several different indices (financials, energy, and etc.) Which one do you think is better for determining overbought and oversold points? I think the % of stocks above their 50 DMA moves faster than the BP%. So in some cases, I use it over the BP%, especially in slow moving index. yeah the BP% is similar to % above 200 MA than 50 MA. They usually hit highs/lows at the same time. I also use a ratio of the two - the possibilities are endless. I wanted to know if there was an easier way to get historical data on BP% and % stocks above their 50 DMA for my custom indices. To get the historical data on Stockcharts, I saved the custom index on a custom scan (BP% or % above 50 DMA) as one of my favorites. I select the favorite and select the lookback days to get the historical data. For each date, I have to adjust lookback days from the current date to get the daily historical date. It takes a long time to get a year worth of date doing it this way. Is there an easier and more efficient way of getting historical data for custom indices? Also, I looked at the % of stocks above their 200 DMA but it seems very slow and insensitive to price movement relative to the BP% and 50 DMA, understandable given that the long time period of 200 days. Thus, I prefer BP% and % stocks above their 50 DMA.